Out of nowhere comes our first look at a few new photos from The Descent 2, the sequel to Neil Marshall's claustrophobic horror film from 2006. Believe it or not, this is already done shooting and is currently in post-production, meaning we should expect to hear some screening reports fairly soon. These photos look fantastic because they were taken by professional photographer Ollie Upton and they come from his website (via SlashFilm). I've pulled out a few of the non-spoiler photos from his set that you can see below. Sure these photos look pretty damn good but that doesn't mean it'll be a great sequel. What do you think? Click on any of them to head over to Ollie's website to see a few more. I'm still a bit baffled by this sequel - I would expect it to have a lot of buzz, but it has almost none! Anyone real reason for this? Distraught, confused and half-wild with fear, Sarah Carter emerges alone from the Appalachian cave system where she encountered unspeakable terrors. Unable to plausibly explain to the authorities what happened - or why she's covered in blood - Sarah is forced back to the subterranean depths to help locate her five missing friends. As the rescue party drives deeper into uncharted caverns, nightmarish visions of the recent past begin to haunt Sarah and she starts to realize the full horror and futility of the mission. The Descent 2 is directed by Jon Harris, who is making his directorial debut after working for over 10 years as an editor. The screenplay was co-written by newcomer James McCarthy and James Watkins, who also wrote and directed Eden Lake. The Descent 2 doesn't have a US distributor yet, although we might as well expect that Lionsgate, who distributed the original Descent, will release this sometime in 2009 as well. **SPOILERS BELOW BE WARNED** I really, REALLY wanted to like the original Descent and the best part, where I hoped it was going to get good onwards, was the first tunnel scene where the rock shifts and starts to trap the two women inside. I got claustrophobic shivers. From then on it was down hill. Or should I say, down the hole. It degraded from a potentially psychological thriller of cave climbers turning on one another from the litany of deep under ground hazards (they list off one at a time in the beginning) to a cheap, standard, predictable, cheese-fest of killing screaming wall climbing bat creatures who's heads explode fake blood like soda filled pop cans. :/ I thought it was really, REALLY overrated. Cheap startle effects, bad mood lighting and jiggle-cam throughout. If it was a student film I might have felt kinder to it, but all in all (even with the better ending of still being trapped in the cave) my high hopes based on the glowing reviews and high scores people placed on it were dashed to bits in a torrent of bad dialog, and horror cliche. Textbook screaming women, who start out sounding like some have an iota of intelligence but in the end make the same litany of bad decisions over and over to where you hope their characters all die to keep the stupid genes from getting into the next generation. What would have made fro a great horror film would have been to play on the strengths of all the climbing info they beat over your head on the way to the cave. All that is scary to real cave climbers will be scary to us if presented well. What should have happened was you never really knowing if what they were seeing was in fact real. And like Jaws and Alien, never giving the audience a real look at the 'creature' while at the same time giving better dialog moments that flesh out the tension between the characters and their histories would have worked far better. The real creatures should have been the women. The real terror should have been losing their light. The only real enemy, should have been themselves as their personalities and their predicament play out to it's tension building to the point of explosion end game. Where exhaustion, oxygen depravation, claustrophobia and fear destroy them one by one as they can no longer tell what is real and what is not. Remember that great line from Empire Strikes Back... Luke - "What's in the cave?" Yoda - "Only what you bring with you." THAT is what this movie should have been and I hope sometime in the future, someone can make that kind of horror film. One where the settings and impact are far more horrific because they are in fact, far more plausible. Nothing is more terrifying, than what's real. The further the filmmakers stray from that, the less it scared or even interested me. If I wanted to see screaming women and guys in rubber face masks, I'll head to the pub on a Saturday night. So far, nothing I have seen or heard about the sequel will lead me to believe it is any different than the first. Looks cool, but I fear this will just be more of the same. A cheap cash-in. It's a pity Marshall ain't directing or writing. I really wish he'd do that "zombies on an oil rig" idea. I can't believe she goes back after getting out of that cave. I freaking miss Juno. She better be alive in the cave somewhere!! Brits!!! I'm still going to see it, but the fact that there's a sequel is really disappointing. As you said #4, why the hell would she go back? Especially since....SPOILER ALERT....her whole team is dead...the rock chick with broken leg got her neck torn out (dead)...Juno hit the suave chick in the neck with the pick axe, and then she was stoned by Sarah (dead)...the mousy climber got her neck sliced (dead)...the motherly climber had her innards ripped out (dead)...and Juno was left with the pick axe through her leg and a dozen albinos bearing down on her (pretty much dead). So, really...she's going to go back? And it even wouldn't make sense if she went back for the bodies since those critters were carnivores. Ugh. BTW -- Those pics are no longer on Ollie's site, so he may have jumped the gun. For anyone who hasn't seen the first DESCENT: Later in this post there will be a !!!SPOILER!!! Granted the fact that Sarah from the first movie is in the sequel so that's naturally a spoiler in itself. So not now, but there will be a !!!SPOILER!!! in my post regarding the first DESCENT. I have high hopes for this sequel as Jon was the editor of the first DESCENT and has a history of editing other Horror movies. He knows the pacing of a Horror film - or should. Sarah was represented as a strong independent woman and an experienced caver/climber: not some domesticated, celebrity tabloid browsing, urban couch potato. It would seem implausible that Sarah, backed by strength of numbers and having survived by experience and her wits already, WOULDN'T go back to face down her enemies. Of course, this sequel is predicated on the American edit and not Neil Marshall's original edit. !!!SPOILER!!! (Yes, I'm about to give that spoiler now) In Neil Marshall's original edit of DESCENT, it appeared that Sarah didn't survive. it ended with her being in the cave, surrounded, and the creatures closing in from all sides. Obviously Jon Harris is taking the American edit, which I felt was superior. I felt the original Marshall ending was a cheat. Not only for the "Oooh! It was all a dream! She is really still back in the cave!" ending, but because this movie, virtually all female in cast, ended with all of these otherwise very strong independent women being unable to survive their circumstances. Her escape made sense. Her suddenly being insane and unable to escape felt like a betrayal of her character. This is a woman who enjoys putting her life in danger. Who witnessed the horrible death of her husband during such a trip and continues to pursue her lifestyle. It would have been one thing if she died due to the power of the creatures or their sheer might of their number, but to die because she was psychologically unfit for the harrowing experience? To die because she just gave up and became a frightened, trembling, crazy woman? I felt the American edit stayed true to the logical consistency of the movie and its characters. 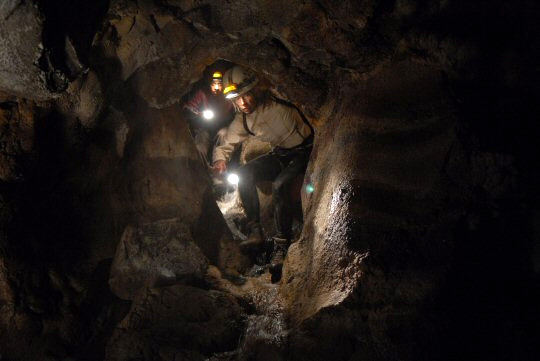 DISCLOSURE: I'm a caver/spelunker of wild caves (former member of the Speleological Society) and have been involved in numerous rescue missions both real and training (granted, not against any monsters). Wow...why is there no support? Because the first movie was horrible along with its counterpart "The Cave" Sure, they're enjoyable the first time on one of the movie channels premiere nights (because they're definitely worth paying for) but aside from that, did anyone expect or want a sequel to a movie that can't really have one? I'm with #1 on this one. The Decent 2 shouldn't even exist. What made the first one so frightening was the ending (or at least the original UK version). It made you wonder, were the creatures real or were they part of Sarah's traumatized imagination? It's a horror film that gave you chills but left you leaving the theater with asking yourself questions. I think that this will be another cheap cash-in sequel. I think that the coolest thing about this topic is that there are researchers that believe that a creature could survive in caves like this. Perhaps that was what gave Neil Marshall his idea. I'm down with a sequel but I believe the first one captured the phobia and suspense. I am kinda pissed about the summary of the sequel. Like Alex said, it doesnt make ANY sense, no matter how you look at it, why she would go back. all of them are dead, and Im PRETTY sure she witnessed all of their deaths, so.....AHHHH! I would just like to say that seeing The Descent in theaters with my one of my best friends is a fantastic memory to have, and we're both excited out of our minds to see this new one, no matter how good or bad it is. And incidentally, we're both infatuated with the character Juno and hoping she turns out to be alive. Loved the first one. One of the few horror movies that sucked you in and made you feel a part of the film. Like being lost in the woods was the scariest part of Blair Witch (for anyone who's actually ever been lost in the woods at least), being in those terrifying caves was the scariest part of Descent. The "creatures" only added to the terror. Anyway, I skipped all the other comments to avoid spoilers. I doubt this will be as good as the original, but it's on my "will see" list. Love the site, Alex. The first half of the first movie was great. Something I have never really experienced before. But then once the monsters were way too overexposed it got corny and just not scary. The plot for this new one seems so far fetched its pretty ridiculous. Why would she want to go back with the search team? It just seems like a lame attempt to make more money off the first. It would be really cool if there ended up being her imagination or just something really cool that no one expects. But it seems like it will be more of the same BS.